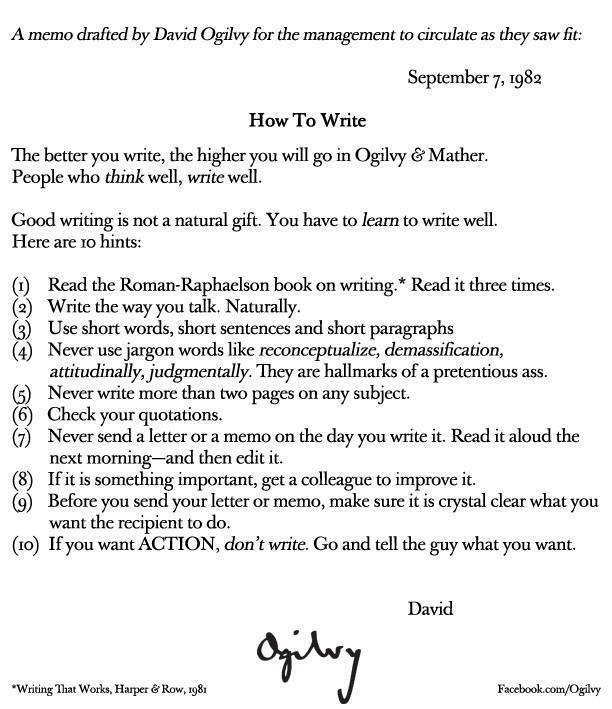 In 1982, David Ogilvy of Ogilvy & Mather wrote an internal memo titled How to Write. The memo was recently posted to the Ogilvy & Mather’s LinkedIn Company Page. The better you write, the higher you will go in Ogilvy & Mather. People who think well, write well. I wanted to always remember this hints, so I saved and uploaded the list below. The first tip is to read the Roman-Raphaelson book on writing three times. During a quick Google search for the book, I found this Slideshare copy of it. Read. Rinse. Repeat. Read. Rinse. Repeat. Read. Rinse. First, the back story. Lou Adler is an author, consultant and recruiter who provides hands-on advice for job-seekers, hiring managers and recruiters on how to find the best job and hire the best people. Lou is also one of the top influencers on LinkedIn with nearly 700,000 followers. I have been following Lou’s posts for quite some time – I respect his sometimes controversial opinions and am even connected with him on LinkedIn. However, I saw something from Lou last week that really stuck in my craw and is at the top of the list of my social media pet peeves. My top issue is with people and companies who think that anyone can do social media and who minimize the profession by not fully understanding the depth and breadth of expertise necessary to successfully create and implement social media and content management strategies. Here’s the rub Lou. It’s all right to hire college interns to gain real life experiences and expertise, but your job post description is cheapening the social media profession by assuming an intern is going to be an all-around digital marketing maven and a savvy digital native and be able to achieve the results you desire. Just because someone has had a Facebook page since they were 13 doesn’t make them digitally savvy from a business standpoint. Not to mention, someone with minimal marketing and life experiences is not going to get you significant exposure, take your Facebook page to the next level and develop their own PR and social media projects. Interns also won’t have the strategic outlook to see the big picture and how various pieces of your business are inter-related. I’m ok with you trying to help a college student and get some marketing help at bargain-basement prices, but don’t diminish our profession with the expectation that you can get a high level of expertise at that price. Real social media expertise comes from years of experience in social media, marketing, content management, branding, customer service, technology, operations, analytics and project management. While there may be some success stories of interns being successful in corporate social media marketing, I have not run across any in my experience. Call it like it is. I have always admired your posts for their honesty and bluntness, and for calling both employers and jobseekers on the carpet for not understanding that the hiring world has changed. Likewise, I trust you’ll respect the bluntness of this message from a social media expert. You wouldn’t hire an intern to handle one of your top recruiting gigs, so don’t think you should hire a short-term-focused intern to be the face of your personal and corporate brand on social media. Too many companies do not really understand what it takes for someone to be successful in social media. I wrote a blog post with my ‘perfect’ social media job description for a project several years ago. When I went back to re-read it today, most of the thoughts I had in 2008 are still applicable today. While some of the social tools may have changed, the need for having deep experience and expertise in the multiple disciplines that come into play for successful social media marketing is still an important success factor. Most (if not all) social media practitioners would also agree with my viewpoint. For example, I found a recent article on Inc.com from titled “11 Reasons a 23-Year-Old Shouldn’t Run Your Social Media.” Hollis asks whether you really want to entrust your entire social media efforts to a recent college graduates who does not have the maturity, social etiquette, business understanding, communication skills and well-rounded expertise in marketing, customer service, public relations, crisis management and branding necessary to do the job properly. Obviously, I am in total agreement with Hollis. Respect the profession. Lou, I just want you to have the proper respect for the social media and marketing profession and stop contributing to the myth that anyone with a social media account can do social media. I want you to successfully use social media and wish you the best in your latest search. Just remember this simple thought…social media is not kid’s play! I do not regularly mow grass as I live in a part of Southern California where our lots are pretty small. In fact, I haven’t even had any lawn to speak of in the three houses I have lived in over the last 15+ years. Growing up, I spent many warm (and humid) summers mowing the lawn at my parents’ house (and for some o my neighbors). So I am well acquainted with the subtleties of lawn maintenance. It is just that I have not had any recent opportunities to use these skills recently. You have to pay attention to details – When you are mowing a lawn, it is important to keep your lines straight and neat. You also have to be careful while doing the edging so you don’t mow down the flowers or knock down any other plants or trees in the process. It is also important to clean up after yourself as the job is not finished until the sidewalks are swept and the mower is put back in the garage. Hard work involves sweat – There is no easy way out when you are mowing a lawn (unless you have a riding mower). Even still, there are no shortcuts to cutting a lawn. You just have to put your head down, roll up your sleeves and complete the task. There is a lot of satisfaction in a job well done – When you’ve done a great job of mowing, the symmetry of a fresh-cut lawn is a thing of beauty. The even cut of the turf, the straight lines from the wheels, the smell of summer and a slight glow from the physical exertion are all things to appreciate. Plus, there is the satisfaction (and slight feeling of superiority) to be part of the rare breed in my circle of friends who actually “get” to mow their own lawn. Celebrating success is a good thing – And of course, the best way to finish off any arduous outdoor activity is to kick back in a lawn chair, absorb the beauty, revel in the expended physical effort and enjoy a cold beverage of your choice. As with all great efforts, celebrating success reinforces the achievement. I am a social media and digital marketing expert who has been using social media to build awareness, tell stories and connect with customers since 2007. The LinkedIn Company Page I used to manage was selected as one of the Top 10 LinkedIn Company Pages for 2013. You can connect with my on Twitter (@tomhumbarger) at this link. You can read my social media marketing blog at this link. My answer to this rhetorical question is yes – unless you are willing to rethink your Facebook strategy and spend money to sponsor your company page posts. While you do not have to spend a large sum of money, my experience has shown that Facebook organic reach is rapidly diminishing and it is almost not worth the effort to continue with the “free lunch” approach. This post is based on a couple of articles that I read recently, and my experience with B2B brands where engaging customers is typically harder than with consumer brands and where the number of followers are generally lower and less passionate. As noted in an article titled “Facebook Puts Everyone on Notice about the Death of Organic Reach“ by Ewan Spence in Forbes.com last month, the conclusion was “the free ride and access to Facebook’s user base is coming to an end.” Ewan also references an article from Social@Ogilvy that proves the point in a dramatic way. Ogilvy has analyzed the organic reach of 100 brand pages on Facebook and identified that the average organic reach has dropped from 12% in October 2013 to 6% in February 2014. Based on this trend line, the organic reach should be near zero by the end of 2014. In the accompanying whitepaper, Facebook Zero, Ogilvy notes that the “power in Facebook remains its potency to generate earned (organic) conversation and engagement”, and concludes that you should not over commit to a single social platform while offering specific recommendations for action based on the “new world order” in the Facebook channel. In my experience over the last 2 1/2 years for managing the social media accounts for a $1 billion staffing company, I have had a first hand view into the declining reach of Facebook – especially when compared with the rising influence of LinkedIn Company Pages. Since I have been analyzing my analytics every week during this period, I had a front row seat able to the steady decline. For both LinkedIn and Facebook, I was posting at least 5 times per week – and both accounts had increasing numbers of Followers. In March 2013, the number of impressions were fairly close for both channels. But over the next 15 months, impressions in the Facebook channel dropped by half while the impressions in the LinkedIn Company Page channel increased by nearly 4 times. The short answer is to “pay up” as it is becoming clear that efforts to achieve organic or free traffic from Facebook is probably not worth the effort any longer. And if you really want to reach and engage your most loyal customers and potential prospects, you will have to pay. If you are not willing to pay up, then I recommend that brands refocus their efforts on the LinkedIn Company Page channel or other social channels, and de-emphasize the efforts for Facebook. In an experiment where I spent just $10 of my own money to sponsor two different Facebook posts in two consecutive months, I proved that paying even a little can have a dramatic impact on overall reach. In the 2 months where I did my testing, I spent $5 to sponsor 1 of 20 total posts for that month. My experiment yielded a paid reach that was 3.5 times more than organic reach and paid impressions that were 4.7 times more than the organic reach. Imagine what you could do with even a relatively small budget. At the very least, knowledgeable social media managers need to understand the new dynamics of the Facebook channel and recognize that they should run their own experiments to see what works best for their brands and their budget. Earlier this year, in honor of its eighth birthday, Twitter unveiled a special page allowing users to automatically see and share their first Tweet ever. This feature is interesting in that it allows you to go back in the Twitter “time machine” to view your own first tweet or the first tweet from anyone with a Twitter account. This tweet is also about when my journey into social media began and brings back some good memories. I was working with Jim Storer, Mark Wallace, Derek Showerman and Aaron Strout from Shared Insight (now Mzinga) to develop and launch a professional community for iRise. The community subsequently grew to over 4,000 members by July 2008 when I left iRise for greener pastures. In the last seven years, I have posted 6,185 other tweets and grew my Twitter following to over 3,150. And my social media journey has gotten even richer with forays into blogging, LinkedIn, Facebook, Pinterest, Tumblr, Slideshare, etc. I no longer remember what the Shared Insights webcast was all about, but I’m sure it was interesting because I remain passionate about the value of engaging with customers and prospects through social interactions. So, what memories will your first tweet dredge up? Check out First Tweets at this link. If this is not one of your organization’s social media goals, it should be. Here are my two steps to propel your company into the stratosphere of a Top 10 LinkedIn Company Page. Due to inexplicable circumstances beyond my control, I recently became a “free agent” just 6 months after the LinkedIn Company Page I managed was selected as a Top 10 Company Page for 2013. It is a little like Los Angeles Dodger pitcher Clayton Kershaw getting his contract release after earning a couple of Cy Young awards and chucking a no hitter. Well, it’s almost like that from a social media perspective. Just think, there are only ten social media strategists who can boast the claim to managing a Top 10 LinkedIn Company Page in 2013, and one of them is currently available to help your company achieve this lofty, yet worthwhile goal! What do I know about Company Pages? Over the last 2 1/2 years, I have learned a lot about LinkedIn Company Pages and have definitely earned my cred. I grew the followers for the AppleOne Company Page from just under 4,000 followers to over 28,000 – a 7x increase during the period. In addition, I have been posting daily status updates for nearly 2 years (which works out to way more than 500 posts in total) and the Company Page is regularly receiving over 100,000 impressions per week which means the Page is on track to record over 5 million impressions for the year. Why is a LinkedIn Company Page so important? LinkedIn is the last professional social media property where brands can still generate strong organic traffic and visibility for free. I have also been managing a Facebook Company Page and have watched as organic traffic on that site has fall to almost nothing. On the other hand, LinkedIn is a captive audience for professionals and most companies have not taken full advantage of the Company Page capabilities. “Smart’ companies are starting to realize that content really is king and that regularly providing their followers with fresh and interesting content builds strong brand awareness while providing a valuable service. Post regular status updates – the more content you post on your Company Page, the more you will keep your company’s name in front of your followers and in the LinkedIn Newsfeed. My best practice suggestion is to post at least daily which means you will need five great posts each week to drive traffic. Post interesting content – you do not want every message on your Company Page to advertise your products or services because that would only serve to annoy or turn off your followers. Instead, it is important to post interesting content that followers will find useful for their every day job or career, or that educates or entertains them in some way. For instance, out of five weekly Company Page posts, only two of the posts would be a link back to the company blog. For the rest of the Company Page content, I use Feedly’s RSS feeder to keep track of more than 75 different blog and news feeds. I scan the headlines on a daily basis, and select the top 12 articles to post on two different Twitter accounts. From this subset, I select the best articles to share on the LinkedIn Company Page. Write a catchy headline or intro – readers are bombarded by countless messages every day so your posts need to quickly grab the reader’s attention from among all of the content they are seeing on all of their social networks or information sources. Ask a thought-provoking question, tease the readers with a snappy tidbit or give them some reason to want to read the post. Don’t forget to include a shortened URL at the end of your headline to link to your content (my favorite is Hootsuite’s ow.ly URL shortener, and there are several other options to chose from as well). Upload your own image – this is one of the most important tips to really power your engagement. By default, if you paste a URL into a status update, LinkedIn will suggest a clickable postage stamp-sized photo from an image at that page. Alternatively, I have found that it is far better to upload my own image which usually with the content’s title superimposed over the picture. Sometimes I use an image from the actual article or other times, I create my own using Canva (my new favorite personal design tool). An uploaded image will be about 350×210 pixels compared to the standard 180×110 postage stamp picture which is a difference of nearly 4x. In an experiment I conducted recently, we were able to gain 87% more Impressions, 132% more Clicks and 39% more Interactions on identical posts. I will publish a follow-up LinkedIn post with more details on this tip. Empower your employees – most companies are still struggling with empowering their employees to engage regularly with their LinkedIn company page. At my former company, we had over 1,500 employees on LinkedIn, but only a small percentage were engaging with our content. We averaged only 41 interactions on our status updates over the last 6 months which would be less than 3% engagement per post assuming all of the interactions are from employees (which probably skews this quick statistic on the high side). When a company can get their employees to recognize that they are essential part of the marketing team and that it is critical to the company’s success for everyone to regularly participate in doing their share to share and promote the posts, I could easily see this ratio pushed into the 10 to 20% range which could easily double or triple the reach of the Company Page. Monitor your statistics – it is also important to monitor the Company Page analytics to see what’s working and what is not working, and then adjust accordingly. I would check the Analytics several times per day and I also kept very detailed weekly records. Over the last six months, I know that our posts averaged more than 19,000 Impressions, 192 Clicks and 41 Interactions. I also determined that my best engagement occurred from Tuesday to Thursday, so I always saved my best content for those days. I trust that you will be able to use these tips to propel your Company Page to the next level – or you could just hire me and we can enjoy the journey together! I am Social Media and Digital Marketing Strategist experienced in both B2B and B2C arenas, and have proven expertise in multiple industries. My many achievements include: creating social media and digital marketing strategies, managing social media properties on a daily basis, curating content and writing blog posts, developing training materials and instructing associates on best practices, engaging with customers and prospects, and evangelizing stakeholders. I was fortunate enough to be involved in Social Media since the early days and I was the 82,754th person to join LinkedIn in December 2003. Contact me by email via thumbarger @ yahoo.com or check out my blog or LinkedIn Profile for more information on how I can help your company achieve your social media goals and objectives.